If you've been following this blog for a while, you will know that one of the places I try to regularly participate is at I Heart Cooking Clubs. Not only do I love the premise of the group, insofar as every six months a different respected chef is chosen for us to follow and learn from - a journey which is long enough for us to really get to know and understand that chef, and to develop an understanding of a cuisine which may push us out of our comfort zones; I also love the community of this group. During the time that I have been particpating, not only have we come to know a number of different chefs pretty well, we have also come to know each other pretty well too. A group of people who cook together and learn from each other, and also understand and support each other, is a wonderful thing, and with Thanksgiving in mind (not actually a festival that we celebrate here in New Zealand), the friendship and community of this group is something I am thankful for. As you also probably know, if you've been reading here the last few weeks, our current journey takes us into the realms of Indian cooking with Madhur Jaffrey - think Julia Child of Indian food. Each week we investigate a different theme, or aspect of this cuisine, and our theme this week is "Root, Root, Root for Root Veggies!" Now, I have to tell you my heart sank a little at that. I'm sure you'll all appreciate this ... You know that feeling you have towards the end of winter when you think that you simply cannot face another root vegetable. 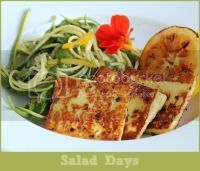 Then spring comes along, and you just can't get enough of asparagus and leafy greens, and you want to eat salads until they're coming out your ears - now, more than ever, you don't even want to think about root vegetables. Which is exactly where I'm at right now. And then ... then ... the very first, most perfect, teeny, tiny, paper-thin skinned new potatoes (Jersey Bennes, even) come along, and you realise that there is indeed a place for root vegetables in your spring/summer repertoire. So when I picked up a bag of these perfect little gems the other day, freshly dug barely hours before at a local market garden, I knew that new potatoes were going to be my root vegetable of choice for this week's dish. Now, we all know that there is no better way to treat a new potato than to boil it until just tender and then drown it in melted butter, so I was definitely wanting to keep it simple. Madhur's recipe, from Madhur Jaffrey's Indian Cookery, for Potatoes with Black Pepper seemed perfect - simplicity itself, and a great side dish to just about anything. No pools of melted butter here, but I decided a little something to dip chunks of black pepper potatoes into would be in order. I started thinking aioli, and then thought the addition of some turmeric and lemon would take it up a notch or two. I've only got one word to say about this dish - wow!! The little potatoes on their own were fabulous - just the right amount of tenderness on the inside, a hint of crispiness on the outside, and a little kick of fragrant warmth from the pepper. The addition of the aioli turned this into sensational. The turmeric added great colour, and a hint of earthiness (take care not to use too much - turmeric can easily overwhelm), and the zing of lemon was the perfect finishing touch. I made enough for two, and since I was the only one eating them I figured I would have enough to go with tonight's dinner as well. Wrong! These were so good that I couldn't help making "Nigellaesque" raids on the fridge all evening, and by the time I sloped off to bed around midnight they were all gone. Have I mentioned that they are just as good cold as they are straight out of the pan. Put whole potatoes, in their jackets, into a small pot, cover with cold water, set over high heat and bring to the boil. Once water is boiling, salt lightly, and continue to boil until the potatoes are just fork tender. Drain and leave to cool completely. Once cooled, peel the potatoes - if you're using new potatoes, no need to bother with this step. Cut potatoes into 2cm dice (3/4 inch) - my potatoes were very small so I simply halved them. Heat oil in a heavy based, non-stick pan set over medium heat. Add the potatoes, and toss to coat well with the oil. Add a generous sprinkling of flaky sea salt, toss again, and then cook the potatoes for about 5 minutes, stirring from time to time. Next add the ground black pepper, mix through, and cook for a further 5 minutes or so until the potatoes are nicely browned and slightly crisp on the cut surfaces. Stir the potatoes occasionally during this time. Remove from heat to a serving dish and top with a generous handful of fresh coriander. Place garlic cloves into a mortar and pestle, sprinkle over a generous pinch of flaky sea salt, and pound until the garlic is mashed to a paste. Sprinkle over turmeric and lemon juice and mix into the paste. I recommend using just 1/4 teaspoon of the turmeric at this stage - you can always add more later. Add the egg yolk and whisk into the paste. Now begin to add the oil, a few drops at a time, whisking it in well and making sure each addition of oil is fully absorbed before adding more. Keep adding oil until you reach a thick mayonnaise of the consistency you desire - the more oil you add, the thicker it will get. Now is the time to taste and adjust your flavourings. Sprinkle in a little more turmeric if you like, add more salt or lemon juice. Once you have the flavour right, you can now adjust the consistency if you like. For example, if you wanted a runnier consistency to make this into a pouring sauce, then you can begin to add warm water one tablespoon at a time, mixing well after each addition, until you get the consistency you want (Note - must be warm water - not hot, and definitely not cold). This aioli would be perfect for dunking all kinds of vegetables into - I hope you'll give it a try. I will have to try this version - my favourite Indian restaurant makes delicious black pepper potatoes, although they give them a different name, and I've never quite been able to get it right. I hope you give them try. I've never come across potatoes like this before in an Indian restaurant, but I definitely liked them, and I think they could pretty much go with any kind of cuisine - more of an international dish really than particularly Indian. Black pepper and potatoes! my spice and starch of choice. I love the addition of the dipping aioli - you can't have potatoes without copious amounts of butter.. or fat. 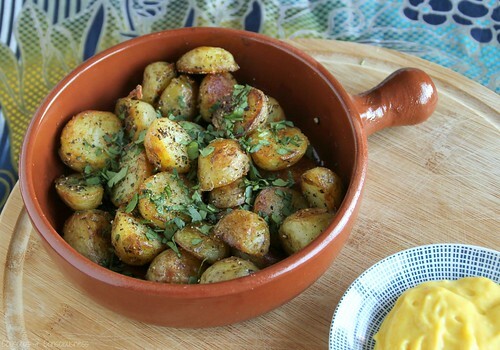 I never seem to get that excited about potatoes, but that aioli could definitely get my heart racing! Wow, this recipe might be just the ticket for the first crop of spuds this season. Sounds amazing. I also like the sound of the blog group; it's so important to keep learning new things. And I think I may be in love with these potatoes. Of course, I will skip the turmeric (ha!). 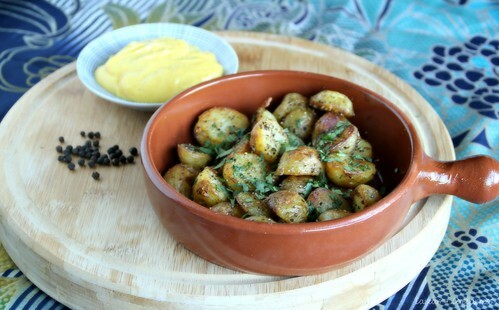 Black pepper, slightly crisp potatoes dipped in a lemony aioli sounds excellent. Michelle, you could definitely skip the turmeric altogether in this aioli and just go lemony. Alternatively you could use saffron - in fact my original intention was to use saffron, but I was all out, and then it occurred to me that the earthiness of the turmeric would be great with the potatoes. It's still going to taste great without it though. Simple and delicious! Potatoes are a favourite in my house and I just know that this would be a winner in my house too. And serving it with the Lemon Aioli sounds so good. I'm so envious that you can get freshly dug-out potatoes! Since we do not grow potatoes over here, ours are all imported. I tried growing them twice before, but of course, failed! Have a great week, Sue! I've been eating potatoes, too, a phenomenon inspired in part by Julie Biuso's book "Dancing on my table" - and right now your post has me hungering for potatoes again! Mmmmmm! I am in looove with turmeric! I never thought to do an aioli though! What a good idea, I can't wait to try it out. And those potatoes look divine. The potatoes look great. Thank you for the detailed recipe!